Last week, I had the privilege of attending one of Denver's most adorable blogger brunches hosted a Coohills Denver (OMG best food ever- you have to try the sliders)! Our very own Abby Miller owner of Denver Darling (IG: @denver.darling) and the sweet girls at Denver Swoozies teamed up to show us all of the adorable products they are carrying this spring! Needless to say..... Holy Kate Spade! :)) Swoozies is currently carrying the MOST ADORABLE summer additions ever! 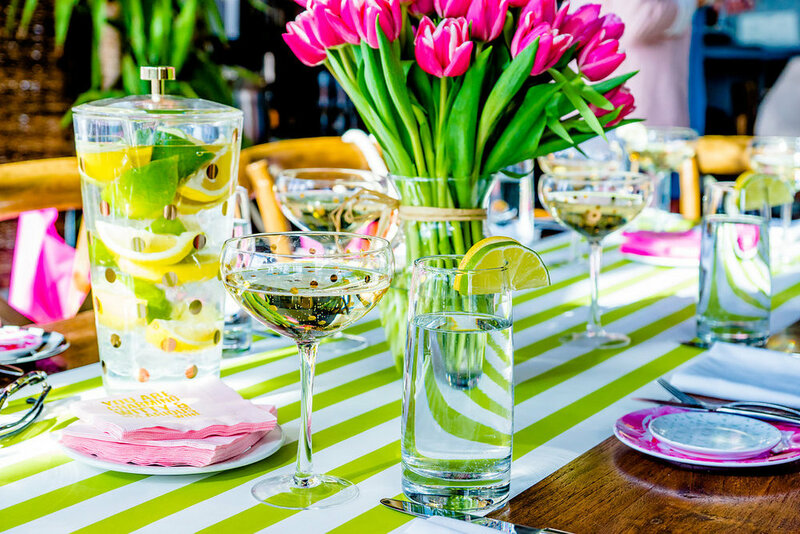 Everything from Kate Spade patio table settings to insulated-monogrammed cups were present just to name a few! Throughout this whole brunch, I couldn't help but think how perfect their personalized goodies would be for brides-to-be. The monogrammed hats are perfect for the upcoming wedding season. I mean it's summer and what bride wouldn't drool over a new sun hat to sport her new initials? I know I'm loving every second of having a new name! A little off topic, but definitely something I'm feeling like sharing is how happy I am right now... This brunch made me realize what a great time I'm having in life to be able to socialize with like minded, beautiful friends!! One of my favorite things about being a Denver Blogger is the community of Denver itself. Denver has the coolest blogging scene! As you can see, we aren't a group of girls competing, we are a group of friends with a love for fashion and life. The girly party decorations and the champagne may have made me a little sappy, but I just want to you all to see a taste of my experiences! Don't forget to click thru the carousel below to get the full event gallery, captured by Corey Anthony Photography. Andrew and I started juicing this past year after moving to Colorado... I know exactly what you are thinking - We moved from the "Big City" to Granola-Town and of course went hippie, but I promise you that isn't the case! After moving to Downtown Denver, we found ourselves in awe of all of the amazing restaurants and culinary creativity this town harbors. Every night we liked to experience a different happy hour and try a new place for dinner. It was the best few months - so we thought! But after a while, we found ourselves feeling tired and sluggish. The desire to work out had become a mere dream and the pounds started packing on! When we got engaged, we both had a renewed interest in losing weight (the right way) and presenting the best versions of ourselves for our soon-to-be spouse! However, after an extended holiday from working out, I was still struggling to get back on the train. That's when I had the idea to juice. Wanting to do it the right way, I did a ton of research and found that not all juices are alike. The ones you buy in store are highly processed to make them last longer on the shelves, and most of the time have been made in a way that your body can't absorb all the nutrients you need. So I kept digging! Finally, I came across one of the best companies in the industry, Denver's very own: THE JUICING TREE. The local store cold presses their juices fresh every morning! A huge win in my book - yipeeee!! The best part? They will deliver the juices to your door, making the whole process easier. The first "juice" I did was only three days long, but the impact was dramatic. On Day 1, my juices arrived via carrier at my office, fully numbered in the order I was to drink them. This numbering made it so easy to follow, not to mention the experts at The Juicing Tree knew just when my body would be craving something and the next juice settled that craving! The juices were filling and I never found myself hungry or crabby (which was a big fear going into it). One of my favorite parts of the cleanse was the fact that I was getting all the calories I needed that day, but my body felt a million times better. I had more energy, more focus, and a desire to workout because I was showing my body a little love when it came to food! The next "juice" Andrew and I did together. This time, we did the full 5 days! Our experience was absolutely the same as my first and Andrew quickly joined me on Team Healthy. We began to change the way we viewed ourselves, as well as the way to wanted to live. We hired a trainer (who will be featured this Friday for wedding prep) and now juice every few months! If you haven't checked them out, you definitely should- you really can taste the difference! I hope you are ambitious about the week ahead -- I know I am! Andrew and I had a wonderful weekend. Saturday we headed the mountains for Fitz’s first hike. 3 hours and 5.7 miles later, he was a full-fledged tree hugger! He absolutely loved the rocks and waterfalls we navigated, not to mention the other pups on the trail. I guess you could say we had an athletic weekend because Sunday we went for a bike ride in the rain! That’s one thing Denver does well… so many opportunities to get active! There’s some exciting things happening on the blog right now; I’ve decided to begin a post schedule to help be more consisted for you all!! Be sure and check back on the days of your favorite topics and sign up for my weekly email. As it’s Monday, I have a brand new recipe for you (and it’s been Andrew approved!). This easy, healthy, and gluten-free banana nut bread will KNOCK YOUR SOCKS OFF! It’s the tastiest snack and the best part is that it’s packed with whole grains and protein. You may need to adjust baking times and temperature for your particular elevation! Introducing…. The B’s WHISKEY BANANA NUT BREAD!! Preheat oven to 400°F. In a bowl, mix all dry (except sugar and pecans) ingredients together until well blended. Beat egg in a mixing bowl, and then add almond milk, sugar, EVOO, and whiskey blending ingredients as they are added. Next, place the mixing bowl containing wet ingredients on the mixer and turn the speed to low, adding the bananas. Once mixed in, turn speed to low-medium and begin adding dry ingredients slowly. Once the last of the oat flour mixture has been folded in the batter, add the chopped pecans. Next, turn off the mixer and place batter in a bread pan. Place pan in oven and bake for 35 to 40 minutes, checking with a straw/toothpick to see if done. Once done, remove from oven and place on rack to cool for 30 minutes before cutting. I hope you all enjoy this recipe as much as Andrew and I have!! I’d love to hear your feedback! Today's post is all about cheesy goodness! This easy to make fondue recipe will have all of your guest begging for your secret... The best part? It's the easiest recipe I know! So grab your skewers and get ready to dip! Mix all cheeses in a bowl with flour until evenly coated. In a double boiler, or fondue pot, heat the white wine with medium heat. Once hot, add in the onion and garlic. Cook until soft. Next, add the celery and carrots. Stir for 30 seconds. Then, add a handful of the cheese mixture to the pot and stir until melted. Continue these steps until all cheese has been added. Once the cheese has been melted, fold in the bacon bits and reduce the heat to low. YOU ARE READY TO DIP!! Take your pre-cut sides and dip them into the cheesy goodness! I hope you enjoy this recipe as much as my family has!! Happy New Year, everyone! Spritz up your holiday with a special, fizzy drink the crowd is SURE to LOVE! This delicious cranberry-champagne spritzer has been a family favorite for a while now. It’s amazing in the summer with some berries and cheese board, but doubles as a go-to holiday drink that pairs well with heavy hors d’oeuvres! This holiday, you too can have all of your guests beg for this simple, easy recipe… except, you won’t have to. You can set up a “Cranberry Spritzer” bar and your guests can be a part of the magic! This little taste of paradise all made possible by the crisp and smooth taste of Stellina Di Notte Prosecco! I've found the type of champagne you add to a cocktail makes all the difference in the world, and this combination is pure perfection! You can snag a bottle at your local liquor store. Place a plate full of sugar on the left side of the bar, next to the glasses. In a plate beside it, pour a small amount of Grand Marnier in the base. 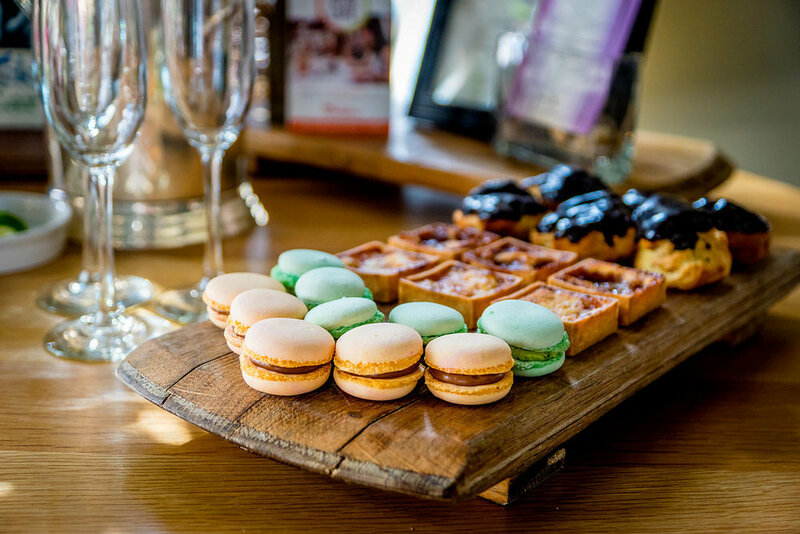 On a sign, ask the guests to dip the top of the glass in the Grand Marnier and then into the plate of sugar. This creates a gorgeous rim! To the right of the “rim station” place the bottles of champagne. Ask the guests to poor the glass 1/2 of the way full. Next, ask them to add 2 teaspoons (or a tad) each of Grand Marnier. For the grand finale, finish by topping their glass off with Cranberry Juice. Garnish with cranberries (or raspberries) and a spiraled orange peel. Today’s recipe is one I found from my favorite healthy food blogger! Ali Maffucci (@inspiralized) is one of the most inspirational foodies in my feed. Beginning her cooking career as a girl with a weight loss goal, Ali has reshaped her life and her career path with the help of her spiralizer. I began following her before she was instafamous; she had but 1,000 followers. Over the course of a year and a half, she has not only exploded on Instagram, but she has also created her own cookbook (available at many retailers including William Sonoma)! So to honor this new accomplishment, I thought making a family favorite would be completely appropriate. Andrew’s favorite food (besides Mexican) is Indian food! We have fallen in love with Yak and Yeti here in Denver. They make the absolute BEST Chicken Tikka Masala. However, every time we go, we have to indulge in a beer – mainly because Yak and Yeti is also a brewery! Trying to keep us on track, I perused Ali’s new iPhone App “Inspiralized” for a Chicken Tikka Masala recipe… and low and behold!!! She had the easiest, yummiest recipe of all time with noodles made of butternut squash – HOW PERFECT FOR A FALL TREAT! "She had the easiest, yummiest recipe of all time with noodles made of butternut squash – HOW PERFECT FOR A FALL TREAT!" Below, I have outlined the ingredients and directions of her recipe for your convenience, but be sure and check out her cooking directions here – she also has a variation of cream bases, along with a funny story every girl can relate to! Needless to say, this meal was as yummy as it looks! The sauce was absolutely to die for and Andrew made me promise to make it at least once a month from here on out. There will be zero complaints from this foodie on that agreement. The healthy noodles make the meal guilt-free! Not to mention we are getting more than a serving of fruits and veggies in a meal that is typically unhealthy. If your trying to lose weight, are gluten intolerant, or looking for a way to spice up your diet… this recipe is for you!